این محصول با توجه به شرایط خاص مراکز حساس که کارکرد سیستم خنک کننده به صورت 7 × 24 می باشد طراحی شده است تا بتواند آب خنک موردنیاز مرکز را تحت هر شرایط آب و هوایی ( از بازه دمایی 20- تا 53+ درجه سانتیگراد ) را فراهم آورد. همچنین ساختار فلزی این محصول به صورتی طراحی شده است تا قابلیت حمل و جابجایی را با ایجاد کمترین لرزش بر روی المانهای داخلی داشته باشد. با استفاده از این محصول این امکان فراهم است تا در فصول سرد سال از دمای پایین هوای بیرون برای خنک سازی آب استفاده شود و کمپرسور دستگاه فعال نگردد . بدین ترتیب کاهش مصرف انرژی بسیار چشم گیر خواهد بود و ضریب بهره وری سایت افزایش خواهد یافت . Base, self supporting frame and panelling in steel plate with protective surfaces treatment in compliance with UNI ISO 9227/ASTMB117 and ISO 7253, and painted with epoxy powders. Orbiting spiral (SCROLL) hermetic compressors with spiral profile optimized for R410A refrigerant. ON / OFF capacity control (0 / 100% each compressor). 2-pole 3-phase electric motor with direct on line starting. Electric motor thermal protection via internal winding temperature sensors. With single refrigerant circuit for S version machines. With double refrigerant circuit for D version machines. Anticondensate insulation made of polyurethane. Temperature sensors on water inlet and outlet. - Maximum capacity relative to the size of the exchanger. - Minimum charge of refrigerant. 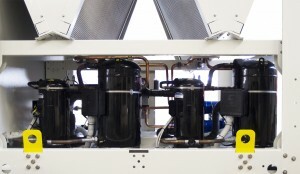 - Reduction of the air flow required for the heat exchange. Sub-cooling circuit to allow a significant increase in cooling capacity. Motorized valves for free-cooling water circuit control. Temperature sensor on ambient air. Axial fans with sickle-shaped blades, fan guard and optimized for low noise levels. External rotor electric motor with stepless variable speed for condensing pressure control. Electronic expansion valve. The valve allows high performance and system efficiency thanks to a timely and accurate response to changes in temperature and pressure. The expansion valve is equipped with energy reserve to allow the closure of the valve in the event of lack of power supply. Filter dryer on liquid line. Service valves on liquid line and gas discharge. Liquid receiver with safety valve. Safety valve on low pressure side. Pressure transducers with indication, control and protection functions, on low and high refrigerant pressure. High pressure safety switch with manual reset. Refrigerant circuit with copper tubing with anticondensate insulation of the suction line. Plastic capillary hoses for pressure sensors connection. Main switch with door lock safety. Magnetothermic switch or fuses for each compressor. Magnetothermic switches for fans or water pumps (if scheduled). Transformer for auxiliary circuit and microprocessor supply.